← Previous Post Mirror, Mirror, On the Wall; What’s the Biggest Cliche of Them All? I grew up on Saturday morning cartoons as well-they were so popular that the Big Three networks even had special preview shows to announce both the new programs and the returning ones,too(anyone else remember those?). The Super Friends were a big part of that,in all of their incarnations-my favorite was the one with the Legion of Doom in that Darth Vaderesque headquarters(wonder why George Lucas never tried to sue them over that)and it was a good intro to new and lesser known DC heroes and villains like Solomon Grundy,Black Vulcan(loosely based on Black Lighting),Giganta and Apache Chief. 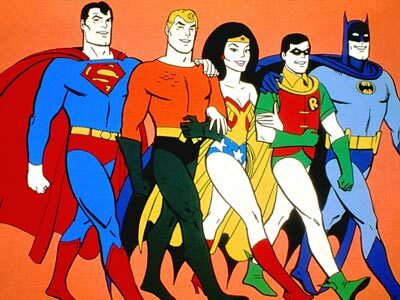 I do like the newer version of the Justice League but still fondly recall those Super Friends days and yes,even the Wonder Twins but not Gleek(even in that episode where Superman was trapped in an alternate universe that had evil Super Friends,Gleek was extra lame). If I had access to a Hall of Doom, I’d hang out there too! That place always looked a lot more interesting to me than the Hall of Justice. Plus, with the inevitable hedonistic impulses of some of the villains, I’m sure there’d be at least an air hockey table and a fridge full of Mello Yello.